Jon Stewart always makes me laugh when he chastises his audience for not connecting with a classic cultural reference (like the ending of Les Miserables). “Read a f***ing book!” he bellows in mock disgust (sometimes at me, since I don’t understand everything he says) and everyone laughs. But the larger truth isn’t really that funny. A friend yesterday posted anti-Obama vitriol on facebook, claiming that Obama has signed more executive orders than all other presidents combined. But it isn’t true. Not even close. He heard it on Fox News, he said; it took me 20 seconds of googling to find the government archives website and get the real numbers. Cousins, friends, friends of friends and old classmates regularly post warnings or forward emails about poisons in packaging, the White House’s supposed refusal to call a Christmas tree a Christmas tree, some heinous thing the ACLU is supposed to have done, or the self-esteem issues of a girl with Down Syndrome whose real name isn’t Mallory. The assault on truth is relentless. In the most heartbreaking development so far, my uber-right brother has cut me off from my niece and nephew (ages 8 and 15) because he doesn’t want to have to answer questions about my being lesbian (a word he refuses to say). 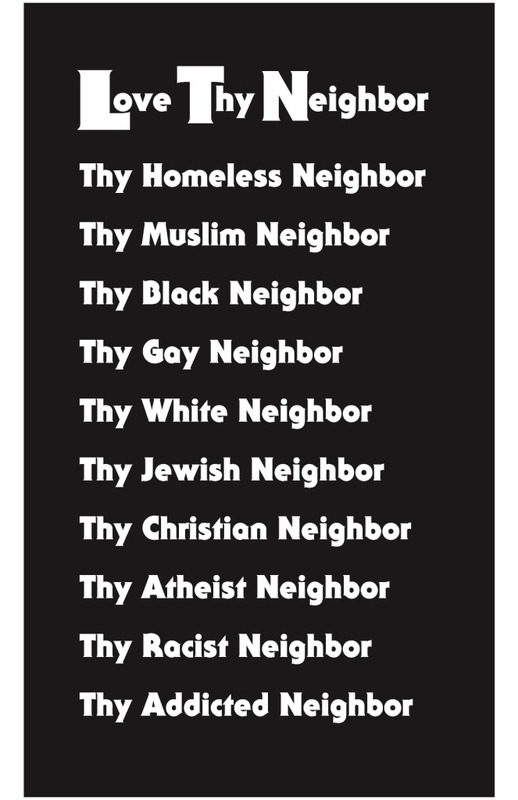 This was precipitated by a t-shirt I sent for my nephew’s birthday (he’s the teenager) that read “love thy neighbor,” and then gave a list of who that might mean. Because the list included “gay neighbor,” he threw it in the garbage and blocked my number from my nephew’s cell phone. A few years ago, I sent the same brother a book I thought might help him “come to terms” with having a gay family member (a truth he’s known for more than 25 years). He threw it away, and yesterday threw the episode in my face. He doesn’t need a book, he said, except the bible. That’s right: his bigotry is rooted in what he perceives to be Christian faithfulness. He knows all he needs to know. Parochialism, limited perspective, suspicion of the experience of those not like us, disdain for difference. Fear of a world we can’t understand or can’t control. A need for power over others, or a fear of loss of power. All these may be in some way ingredients in the hostility soup that is our culture these days. I’m overwhelmed. I feel like Elijah[i], searching for a cave in which to avoid the venom of hatred that is all around. Self-preservation seems a worthy goal some days. Where even to begin? How to combat the comfort so many people find in ignorance? And when that ignorance becomes violent, as ignorance so often does, who do we suppose will claim responsibility? The churches, “news” stations or facebook groups that incited it? Doubtful. One pressing question is how to get Elijah out of the cave. There is no energy for me in hurling epithets of my own. I don’t want a culture war. I want rights as a gay American and I want justice for my neighbors who are economically deprived, environmentally poisoned, and emotionally overwrought. A further question is how to advance the cause of knowledge. God got Elijah out of the cave by giving him a new assignment. UrbanSpirit, the center I run here in Louisville, has a mission of poverty education; our primary tool is a week-long simulation of life at minimum wage. We’ve learned that putting ourselves in other people’s shoes is a powerful way to gain understanding, insight and empathy. We invite groups from all over the country to come and experience this reality. This is my work, my passion, my assignment to keep me from the cave. Some days it feels like droplets in an ocean. But it is something I can do. Way better than calling names or spreading someone’s lies. About a decade ago in a difficult time, I dreamed of God, and I heard – in waking or sleeping, I can’t be sure – the voice of God saying, “I am faithful; you be faithful.” I think of that regularly. So I’ll continue to speak, to preach, to teach, to try to have conversation, to challenge the lies and put forward the truth. And I’ll keep trying to support and encourage truth-tellers I meet on the path. [i] 1 Kings 19 in the Hebrew scripture (what Christians tend to call the “old testament”).